On this premiere podcast episode-1 Sura Khan talks about social media & the entertainment industry. Also giving great advice to actors and other media practitioners about social media’s do’s and don’ts. Enjoy the extras such as Ask Sura Khan, History in Entertainment and Powerful lyrics quotes. Sura Khan’s Whispers of Wisdom, I’m Just Saying (IJS) is a weekly Podcast, Host & Produced by 30- year entertainment industry veteran Sura Khan. A filmmaker, Writer, Director, Producer, and Author with vast amounts of Knowledge, Wisdom, and Experience in the Entertainment Industry. Sura Khan talks on a informative general topic for each weekly episode. He offers enlightenment, inspiration and direction for listeners interested in the Film, Television, Music and the Book Publishing industries. Also those listeners most interested in the general episode topic. The format is set up as a one on one interment conversation between Sura Khan and the listener. The program also features two formats called “Ask Sura Khan” where the host shares and answers to questions sent in from listeners and viewers of his web site and his mentoring message board on LinkedIn. Most questions asked are seeking advice and guidance from Sura Khan. The second feature is called “History in Entertainment” where the host shares interesting information about people, places and events in the entertainment industry that might have fallen under the radar and should have light shined on it. In addition to History in Entertainment A sub topic called Close Encounters & Purposeful connection where the host shares exciting and meaningful connection among various people including his own experiences. Also In an exciting segment titled “Power Lyrics” Sura Khan quotes powerful one liners from song lyrics that are most compelling and inspiring to the host. 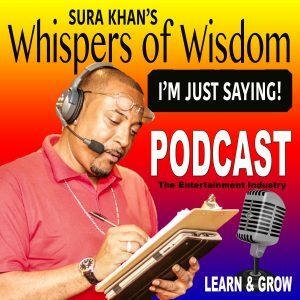 With so much information and experience’s to share with others Sura Khan has found the perfect outlet with his new Podcast “Whispers of Wisdom” and welcomes you to come along for the ride. All Aboard The Sura Khan Express! Also Available on Stitcher: http:// ​​https://www.stitcher.com/s?fid=381660&refid=stpr.